Fresh cut assorted vegetables in stir fried onion, ginger, garlic & mild sauce. 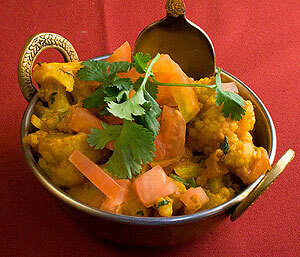 Fresh cauliflower and potatoes cooked with herbs & spices. Select Spiciness: Make Selection Hot Extra Hot How Many? Fresh eggplant, baked and cooked with onions, tomatoes and spices. Fresh mushrooms cooked with chopped onions, tomatoes & spices. 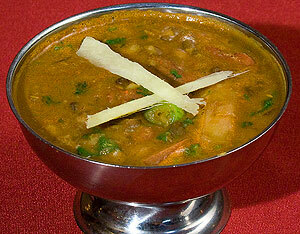 Green peas and homemade cheese cooked with spicy gravy. 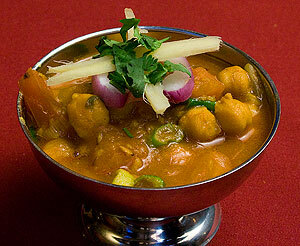 Fresh cut vegetables, Cooked with creamy sauce almonds, nuts and raisins. 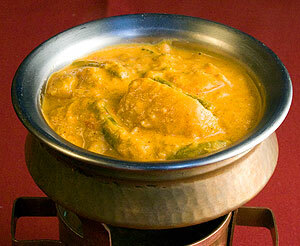 Ground vegetables and paneer cooked with creamy sauce. Fresh cut vegetable & cheese cooked with herbs & spices. Fresh spinach cooked with herbs, spices and potatoes. Fresh cut okra cooked with chopped onions, tomatoes and spices. 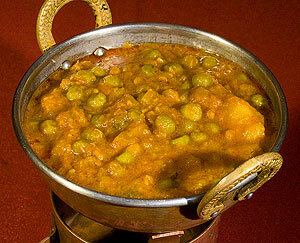 Green peas and potatoes cooked with chopped onions, tomatoes & spices. Homemade cheese in creamy tomato sauce. Fresh mixed vegetables in coconut milk. Fresh mixed vegetables cooked Hydrabadi style with spices, apricots and potato straws. 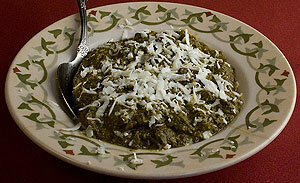 Fresh spinach cooked with lentils.